Mykonos is one of Greece’s most glamorous islands, making it a perfect location to visit. The island is found in the Cyclades group in the Aegean Sea and can be easily reached by air or boat from nearby islands. 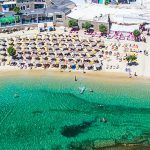 Due to the boom in tourism to Mykonos, new hotels, beach bars and restaurants are popping up all over the island just waiting to be explored. The island also offers a multitude of activities for everyone to enjoy, from visiting ancient ruins to scuba diving and sailing. One of the main reasons for choosing an island as adestination is the number of beautiful coves, beaches and water based activities on offer. Elia Beach is the longest beach on the island, perfect for hand held strolls along the pristine sand whilst Paraga Beach is a popular spot for sipping cocktails and watching the sunset. Paradise is a long sandy beach with turquoise waters located on the north side of the island. The beach is organized with numerous amenities including sunbeds, umbrellas, water sport facilities and beach bars. A fully organized camping site is located behind the beach. Cavo Paradiso is the large famous complex of Mykonos hosting numerous parties every summer. 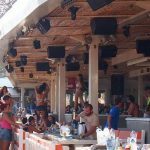 By night, the beach transforms into a huge club with music and cocktails. Ornos is a sandy beach with turquoise waters located on the west side of the island. 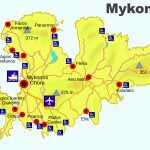 Due to its close proximity to Hora, it is one of the most crowded beaches of Mykonos. The beach is organized with numerous amenities including sunbeds, umbrellas, water sport facilities and beach bars. 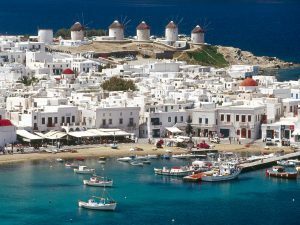 Besides the beaches and water activities, Mykonos is known for it’s stunning white architecture which is best explored on foot in the likes of Mykonos Town, home to the famous Windmills. The island is also home to a number of hiking trails and bike tours. The cocktail bars in the Little Venice area of Mykonos town are popular sunset spots. After dinner, revellers head for small disco bars all over town. At Cava Paradiso, the open-air clifftop club above Paradise beach, punters queue to pay €40 (£27) for entry from 2am until dawn and beyond.